Primarily available in classic blue, the FRIGIDAIRE FAQG7072LN's only evidence that it is as peaceful as its exterior color is its trademark Affinity series SilentDesign technology. The rest of its features, from the DrySense Technology and Moisture Sensor, are all about applying the most intense or efficient performance while still caring for the fabrics. Thanks to the dryers DrySense Technology, the garments are submitted to precision but gentle drying. The garments per load are all cleaned thoroughly without becoming all worn out. The FRIGIDAIRE FAQG7072LN also has a Wrinkle Release Technology. So, by the right choice of settings, the consumer can ensure that the garments will come out of dry and wrinkle-free after the cycle. The combination of settings will be automatically saved by the system, ready for the next use. 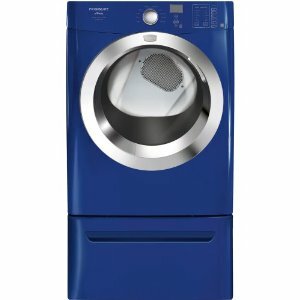 The FRIGIDAIRE FAQG7072LN dryer from the Affinity series does not come with an Energy Star certification. Still, an Energy Saving option is available for selection. The consumer can save up to 35% of energy with that option. SilentDesign enables the consumer to dry even the heaviest loads without getting disturbed. Because of the silent operation, the consumer can concentrate on other tasks without being bothered. The FRIGIDAIRE FAQG7072LN cycles are fast and efficient because of the TimeWise technology that the gas dryer model makes use of. Because time is saved, the user can do other chores and even unrelated tasks. The Delay Start feature enables the user to set the time of operation so that the dryer can start its task even if the user is not home. Express Select Controls make the FRIGIDAIRE FAQG7072LN dryer easy to use. The starter/cancel/pause button needs only be pushed to turn on the appliance. The dryers door is reversible. This feature is convenient, especially in laundry areas that are small enough to make some maneuverings difficult. Reversibility allows for the door to be opened in the direction of the less crowded spot in the laundry area. The drum has a 7.0 cubic feet capacity. It is made of stainless steel so that it can withstand the constant exposure to moisture. The console color and cabinet color is white, meaning that it does not necessarily match the main exterior color. Alternative colors to the classic blue color are classic white, classic red and classic silver. The FRIGIDAIRE FAQG7072LN has SpaceWise characteristics that make it easy to store in small spaces. The reversible door is an example. The product is safe to use around young children as it comes with the safety lock feature that prevents the door from opening when the appliance is being used. Fabric care is important to the FRIGIDAIRE FAQG7072LN. Even though the drying is thorough, the fabrics, whether delicate or not, are well-taken care of. The FRIGIDAIRE FAQG7072LN has not qualified for an Energy Star rating.